Join us for our Grand Opening! 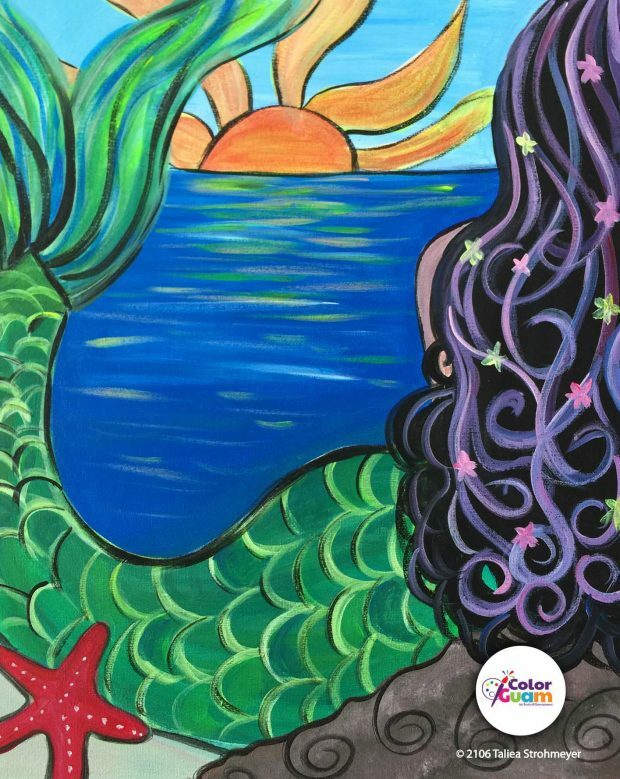 Color Guam® invites you to paint Sirena & the Sunset. Bring your friends or family members for three hours of creative bonding. No experience necessary, step by step instruction. We provide all the supplies: 16×20 canvas, use of paints, brushes & tabletop easel, you don’t have to worry about a thing (except having a great time!). We even offer coffee & h20. This is a special Grand Opening Event for Color Guam! Complimentary Appetizers to be provided! Face painting for kids, balloons and a whole lotta fun! Painting session begins promptly at 1pm. Show up 30 minutes early to sign in, get yours or your child’s face painted and munch on some appetizers and get some balloons. Please allow extra time to find parking and get settled. If you’re coming with a group (hurray, the more the merrier!) make sure you arrive early to get seats together.